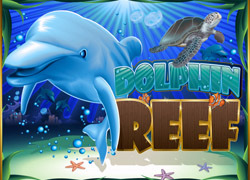 Dolphin Reef slot is a bonus rich video slot from playtech with an underwater theme. This slot game has 5 reels and 20 paylines. The Scatter is an underwater treasure chest; the Wild is a dolphin which streams into an adorably playful trio during the free spins. Other graphic symbols in this slot are a turtle, starfish, seahorse and a marine fish. 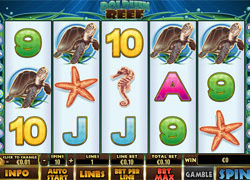 When the dolphin appears on reels 2 and 4 the payout is 5 free spins. The reels 2 and 4 expand into masses of water with 3 dolphins frolicking around leaping from reel 2 to reel 4 and back during the free spins! In the free spins, all the positions on reels 2 and 4 substitute for all of the symbols including the chest; for the Scatter they count only once. During the free spins only the reels 1, 3 and 5 are active and all the wins here add up to the payline and Scatter wins.